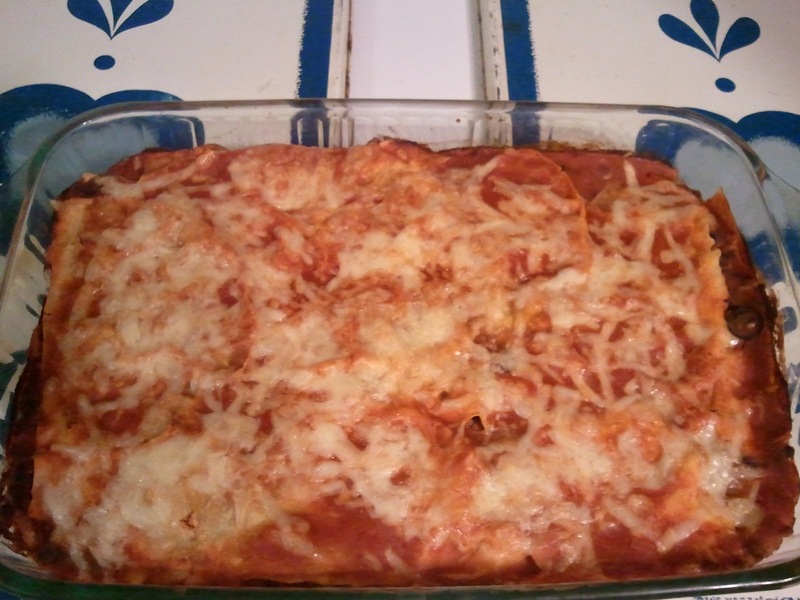 I've made enchilada casserole before. I've even blogged the recipe, without pictures. 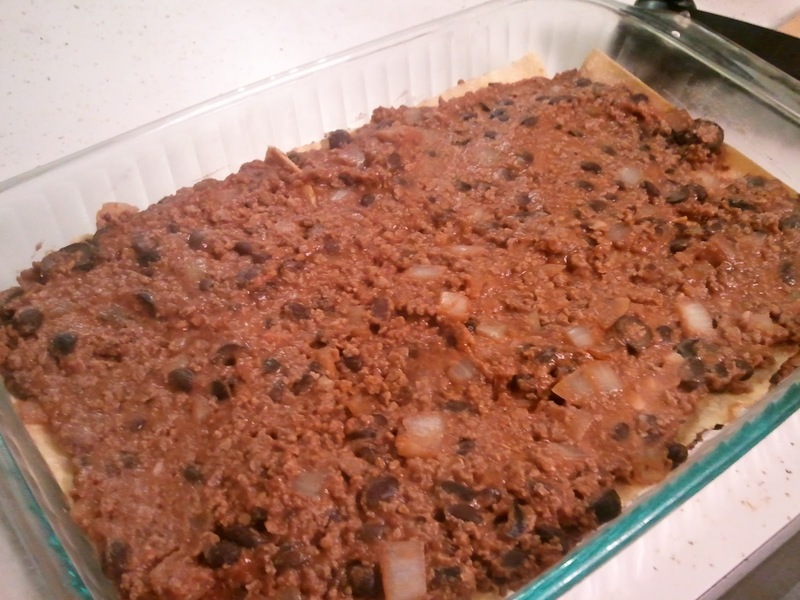 But friends—I've never made a vegetarian enchilada casserole like this. This... is... so... good. The filling is made of black beans, refried beans, Quorn grounds (non-soy fake meat! ), black olives, white onion and a jalapeno sauce. My mouth literally watered writing that. You're going to build this like a lasagna, but with non-fried corn tortillas instead of pasta. 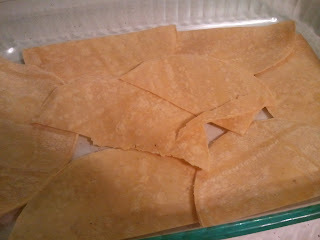 To let you in on a little secret: this is even better if you fry the tortillas in a little vegetable oil first. But after spending nearly a week off-skates, I was feeling quite hippo-like and wanted to make this as healthy as possible. Usually I pour some sauce into the bottom of the pan, but I forgot this time. It seems to work either way. I'd recommend spraying your pan. I also forgot that. Then spread in half of the filling. Obviously you could use hamburger if you'd like. But I recommend trying Quorn as a meat substitute or just leaving it out completely for an occasional meat-free meal. 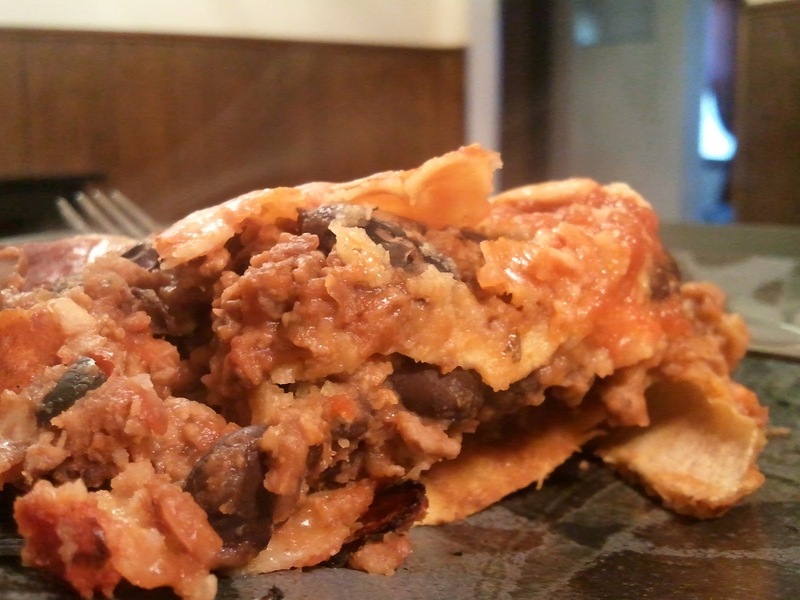 If you left out the cheese or used a vegan cheese substitute, this could be vegan! I would not leave out the cheese entirely, but that may just be me. Repeat the tortillas, meat filling, and more tortillas. Finish with a tiny can of enchilada sauce, preferably El Pato. I used a little sharp white cheddar over the top and baked at 350ish until it looked like this. 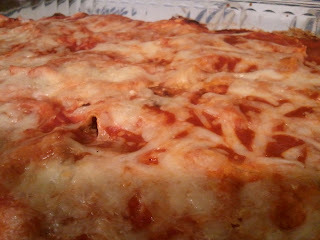 Looks like lasagna, doesn't it? I like 9x13 glass pans that have corresponding lids. 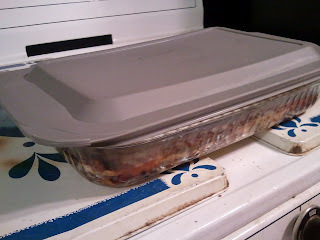 That means I can eat some, let the rest cool, throw on a lid, and pop the whole thing in the fridge for leftovers. This also saves Mr. CookingOnSkates from washing quite so much Tupperware. This really served up nicely! It's lower-fat and higher-protein than my previous version. I'd serve this to just about any guests, and it makes a great practice-day lunch. There's enough beans that I wouldn't recommend eating it for dinner the night of a derby practice. 1. Preheat oven to 350 degrees. Spray a 9x13-inch baking dish. 2. 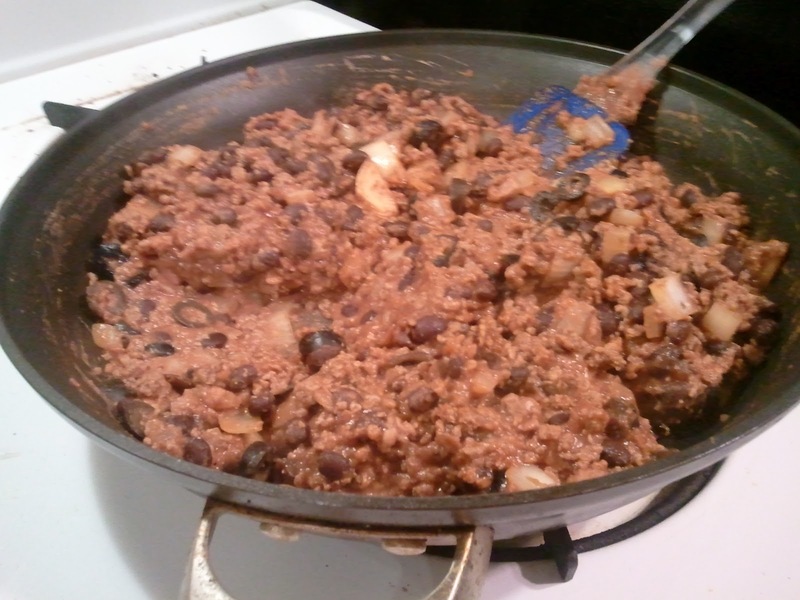 Thaw Quorn grounds in large skillet with oil. Add onion, black beans, refried beans, olives and jalapeno sauce. 3. 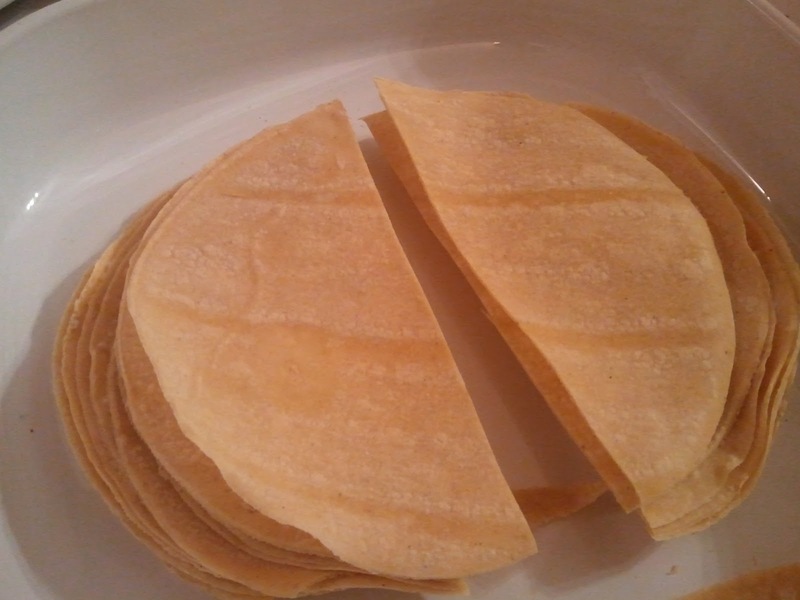 Make a bottom layer of tortillas. Spread half of the filling on top of the tortillas. Repeat tortillas, filling and a final layer of tortillas. 4. Cover with salsa de chile fresco. Finish with grated cheese. 5. 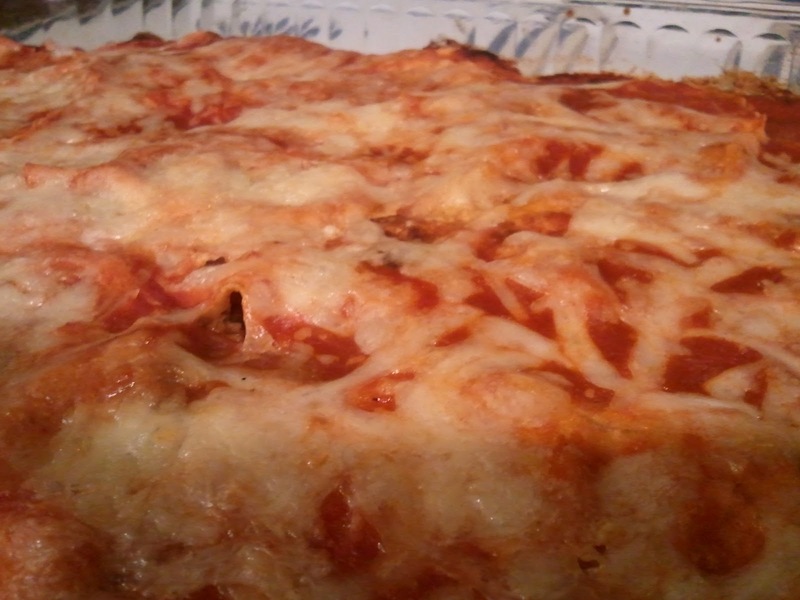 Bake at 350 degrees until cheese starts to brown, about 30-40 minutes.